It’s always advised to look at the original. 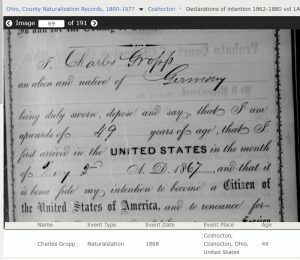 The entry for Charles Gropp in FamilySearch‘s “Ohio, County Naturalization Records, 1800-1977” is an excellent reason why. The index entry indicates that the 49-year old had a “naturalization” in 1868 in Coshocton, County, Ohio. That’s not quite what Charles Gropp did on 27 November 1868. What he did on that date was to declare his intention to become a citizen of the United States. The heading on the “cookie trail” in the browser window even indicated that this image came from the Declarations of Intention from Coshocton County, Ohio, between 1862 and 1880 (Volume 1A). There’s not guarantee that Gropp ever naturalized–at least not on this image. Declarations were filed (usually) shortly after arriving in the United States or at least shortly after realizing they had decided to become a citizen. The declaration of intent date has a different interpretation than the naturalization date–largely because there’s not the time wait to declare during this time period like there is for those who were naturalizing. This intention gives Gropp’s arrival date. Not all declarations of intention provide this information. Always read the original and make certain you know what you are looking at. How you interpret a document hinges on it. 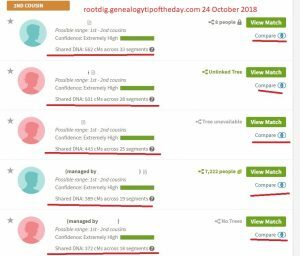 ← 57% of My Ancestors Were From Great Britain?! It’s frustrating to be sure. I’m glad there’s an index–because that helps. My concern is that some don’t bother to read the original record and take the database entry as being correct.